Music Tours and Cruises are sightseeing tours, for all travellers, with a focus on music, especially in the evenings. We run international music tours and cruises to various parts of the world, and we run outback music tours to various parts of Australia. The music performances our tour groups attend range from famous shows, like the Edinburgh Tattoo, Grand Ole Opry and Preservation Hall, New Orelans in America's deep south to informal performances in pubs, honky tonks, and dance halls. We also run Music Cruises. Our Music Cruises are sightseeing cruises, on luxury cruise ships, with a focus on music. We organise our own on-board music concerts and events, exclusively for the patrons who go on our music cruises. You do not have to be a musician, or even be passionately interested in music, to go on a Music Tour. Music Tours (and Cruises) are, first and foremost, designed as outstanding travel experiences. Music is a bonus. Obviously, though, music is the special feature that makes our tours different. If you are a musician, you will love our music tours. 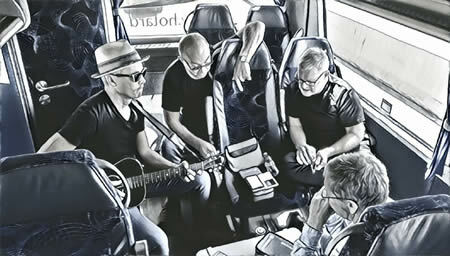 We encourage tour members to be involved in informal music 'sessions' whilst on tour. John Howie's is passionate about his Music Tours and every tour is the result of a huge amount of thought and 'attention to detail'. He has been organising Music Tours since 1995, and his tours are full of travel/sightseeing 'gems' and unforgettable music highlights. In places like Dublin, Belfast, Edinburgh & Glasgow (in Ireland and Scotland), and New Orleans, Memphis, Nashville & New York. John knows the best music venues to visit and the best performers to see. Our policy, with accommodation, is to stay in centrally located first class or moderate first class hotels. This gives us ready access to good live music venues. With our coach tours, transport is by luxury chartered coach. Join one of our wonderful 2019 tours or cruises.